Can you make a rug that is made-to-measure? Lorena Canals offers different sizes for each product-type and special sizes cannot be made for just one unit. Acrylic: 120x160 cm, 140x200 cm, 200x300 cm y 80x200 cm. Wool: 120x180 cm, 140x180 cm, 140x200 cm, 145x208 cm, 150x160 cm, 150x200 cm, 170x240 cm. However, if your problem is a rug not fitting because of a bed or other item of furniture, you can still use one of our washable rugs: being are light and not excessively thick, they won’t make your furniture wobble even if you put part of the rug underneath. If what you want is a larger rug on the other hand, you can combine different models and colours. What accessories go with my rug? At Lorena Canals we also design washable cushions that combine perfectly with our rugs, as well as woollen and cotton blankets, wall decor and storage baskets. We offer all the accessories you need to create harmonious and cosy environments. Will the rug fit in my washing machine? My rug is a little bit longer/shorter than advertised. Our rugs are made using artisanal methods. Each piece is cut by hand, so their size may vary slightly. You can watch the process of making our washable rugs by visiting the brand’s official YouTube channel. Are the tassels included in the measurements of the rugs? The measurements given for each rug are those of the base; they do not take into account the length of the tassels. What type of detergent should I use to wash my rug or accessory? 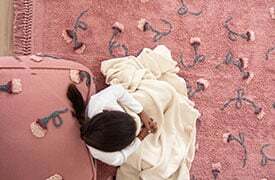 The rugs and accessories (except wall hangings and wall décor, which should be washed only by hand) should be washed at a maximum temperature of 30˚C, using a programme for delicate clothes. We recommend that you use a mild detergent, free of whitening agents or conditioner, to avoid any problems with the material or the colour of the product. For more details, please refer to our washing and maintenance instructions. Can I use conditioner to wash the rugs and accessories? Conditioner contains chemical components that may damage rugs and accessories, so it is not advisable to use them when washing. For more details, please refer to our washing and maintenance instructions. Can I wash the cushions without taking out the stuffing? Yes! Our cushions are totally washable: rather than removing the covers, place them directly in the washing machine complete with stuffing. The cover is 100% natural cotton and the stuffing is 100% polyester. For more details, please refer to our washing and maintenance instructions. Can I dry the rugs and cushions in a dryer? Yes, both the washable rugs and the cushions can be placed in a dryer, as long as the lowest temperature setting is used. Drying the washable rugs in a dryer will make their texture even more soft and fluffy. Prior to first use, we recommend that you put your rug in a dryer for 10 minutes at a low temperature to get rid of fold creases formed during packing. For more details, please refer to our washing and maintenance instructions. How can I store my rug and keep it in good condition? If you want to remove your rug for a while, you can fold it and keep it in a cupboard or anywhere that is not damp or in direct sunlight. You can also roll it up to avoid the creases that come from folding, but if it is folded for a long time, you can put it in a dryer using a short programme and any creases will disappear. Do the rugs and accessories lose colour after being washed? El color es fijado durante el proceso de elaboración, por lo que no supone ningún problema lavar el producto las veces que sea necesario. Sin embargo, recomendamos lavar la alfombra o complemento por separado, ya que en los primeros lavados puede perder algo de color resultante de los excedentes de algodón que quedan entre las fibras después de pulir el producto. Puede consultar más detalles en nuestras instrucciones de lavado y mantenimiento. Can my rug be placed in direct sunlight? Sunlight may damage the colour of the rugs, because they are made from 100% natural cotton and artisanal dyes, so we recommend that prolonged exposure to sunlight is avoided. For more details, please refer to our washing and maintenance instructions. Can I leave damp rugs or cushions in the washing machine? We recommend that you immediately remove the rug from the washing machine when the programme ends and spread it out in a dry place to dry or put it directly into a dryer at a low temperature setting. Do not under any circumstances leave a damp rug in a washing machine after washing, because the humidity may cause the colours to run, damaging the rug’s original dyes. Don’t forget that our dyes are natural, non-toxic and made using artisanal methods. Your rug will not lose colour after washing, because all the dyes are fixed during the process of manufacture. However, this is an artisanal and delicate product that, like any natural cotton textile, requires special care to keep it looking like new. For more details, please refer to our washing and maintenance instructions. Will the cotton basket lose its shape when it is washed in a washing machine? It is recommended not to wash to avoid losing the initial shape. Don't worry if lint appears, as this is residue fiber produced from cutting the cotton. Should you find any long or loose threads, cut these using a pair of scissors. Never pull threads. Keep away from fire. I need an anti-slip base for my washable rug. At Lorena Canals we offer anti-slip PVC meshes that are placed underneath rugs so that, depending on the type of flooring, they do not slip in the slightest. With their very dense weave they are extremely high quality, and are available in two sizes: 110 x 150 cm and 130 x 190 cm. My rug releases fluff. Is this normal? Our rugs are 100% natural and made in an artisanal manufacturing process, which is why the material can release fluff. Every rug is woven by hand and the details are finished off with scissors. Fluff consists of the cotton fibre that may remain trapped in the weave after putting the finishing touches to the rug. To avoid fluff, we recommend brushing the rug in the direction of the nap to gradually remove the remains that may have been left behind and using a vacuum cleaner frequently during the first few weeks. You can watch the process of making our washable rugs by visiting the brand’s official YouTube channel, and find more details in our washing and maintenance instructions. My rug is not the same colour as the one in the catalogue. Just like the other parts of the manufacturing process, the dyes used in our rugs and accessories are artisanal. The dyes are natural and boiled in water, before being used to dye the cotton. This is why the final colour can sometimes vary slightly. 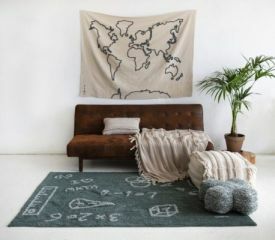 The hand-made nature of our rugs and accessories is our seal of quality: each article is unique, no two are exactly alike. You can watch the process of making our washable rugs by visiting the brand’s official YouTube channel. Washable rugs have to have the flexibility needed to put them in the washing machine. We have varying thicknesses of cotton rug, but all of them are light and can be easily moved from one place to another. This makes them more practical, not only because they can be washed at home whenever necessary, but also because their location can be changed depending on your needs. My rug has some creases from folding. How do I get them out? Marks like these come from folding the rug and storing it for a while. Prior to using it for the first time, we recommend that you put it in a dryer for 10 minutes at a low temperature setting to remove the folding marks created during packing. If you do not have access to a dryer, a rapid washing machine programme will achieve the same effect. For more details, please refer to our washing and maintenance instructions. I have underfloor heating. Can Lorena Canals rugs still be used? Yes, our rugs are completely suited to this type of heating; there are no ill effects in terms of their appearance, quality or product life. How can I tell if my rug is a Lorena Canals original? All our rugs bear the signature of Lorena Canals sewn into the base, which certifies its quality and authenticity. 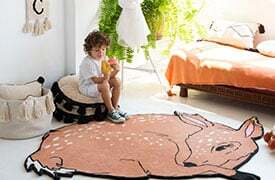 Lorena Canals is the brand that originated the concept of washable cotton rugs. More than 15 years’ experience vouch for our products and enable us to improve every day in accordance with our customers’ needs and market trends. You can watch various videos about the process of making our products by visiting the brand’s official YouTube channel.